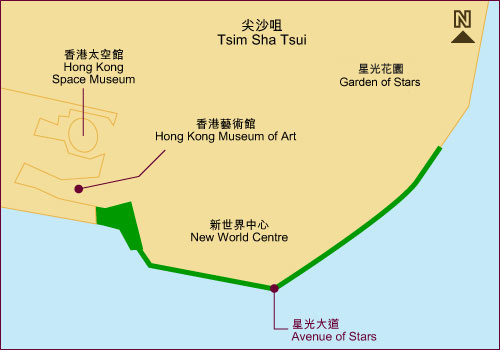 Located on a prime stretch of the Tsim Sha Tsui waterfront, the Avenue of Stars was created in response to visitors' keen interest in Hong Kong movies, and also to recognize the contribution of the film industry to the tourism and economic development of Hong Kong. Since its opening in April 2004, the Avenue of Stars has become one of the must-see attractions for visitors to Hong Kong. To strive for an even better ambiance and visitors' contemporary experience, the Avenue of Stars is re-open on 31 January 2019 after the repair and improvement works with a view to presenting a brand-new and more exciting leisure and entertainment destination to the world. Some other movie-related exhibits are displayed at "Garden of Stars".